You may have seen my happy announcement about my girls being sponsored by FOX Kids & Baby on my Instagram or Twitter. FOX is one of my favourite brands for children's clothing, and both my daughters own a number of casual, everyday items from FOX Kids & Baby. In fact, several of these items have previously appeared on this blog, as seen here, here and here. I love the fact that this brand marries comfort, quality and design at a price point that is affordable. Needless to say, we were thrilled to embark on a partnership with a brand that we like. It was a bonus that the selection at the FOX Kids & Baby stores today carry a range of tasteful and modern Disney and Hello Kitty designs. So, I took Bubbles shopping! You know, Bubbles has never quite gone shopping for clothes before. I have always bought her clothes for her, estimating size, and choosing items either for practical purposes, or selecting styles that I know she will wear. It was therefore a most exciting outing for her, doing the grown-up thing of selecting clothing off a rack, and trying them on in a fitting room. She was prancing around the whole time, and bantering with the sales rep, who by the way, was super amused by Bubbles and told me on another day that she looks forward to seeing her again. I inwardly groaned a little when Bubbles first started selecting only PINK items! Thankfully the pink shades available are in tones that I myself like - strong, warm pinks. She picked out a pair of gorgeous dark pink skinny jeans to match a pair in the same shade I recently bought for myself. She undoubtedly looks better than I do in them, being tall and lean like her dad! Bubbles is also very much a Disney fan, and we could not walk away without getting something with a Mickey or Minnie Mouse on it. 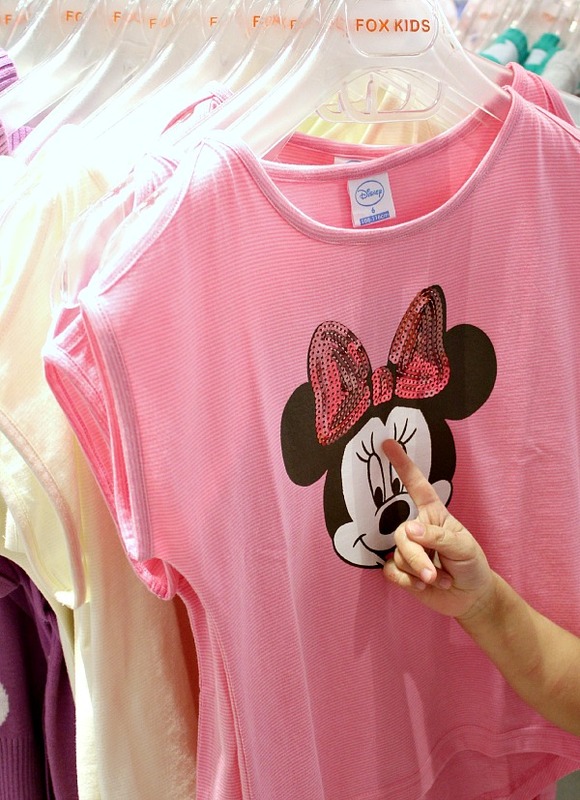 She found slit-shouldered pink t-shirt with a Minnie Mouse and sparkly sequins. For course this had to go into our shopping bag! 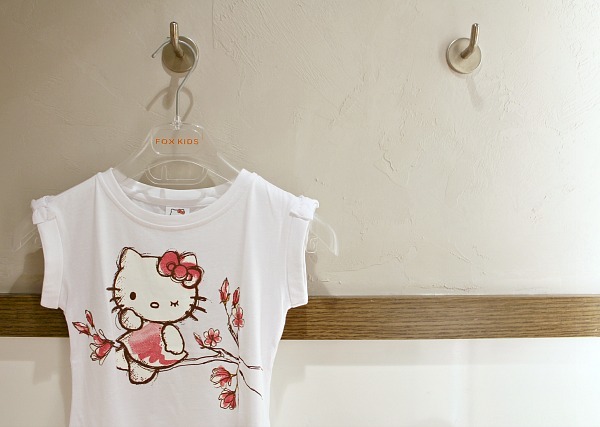 We also picked out a pretty Hello Kitty white tee. She liked the Hello Kitty, we both liked the white, and I liked the effective use of a few colours to make this an understated piece. The watercolour effect adds a nice current touch. FOX always carries a range of basic cotton pieces in seasonal colours. Stuff like basic t-shirts, leggings and shorts. I find them really practical and we always have a few pieces in rotation.We picked out two pairs of shorts for Bubbles to wear to school, including a pair in a lovely aqua shade. Since September will be a month of celebrations, with Bubbles turning four and a cousin getting married, I let her pick out a dressier item. We really liked this flutter-sleeved dress with a sash tie. Again, she chose a colour that I too have as a dress (this girl just wants to be me. oh dear.). But really, a lovely coral shade like this looks beautiful on our skin! Shopping for Bubbles done, I went on another day to select items for Bun. 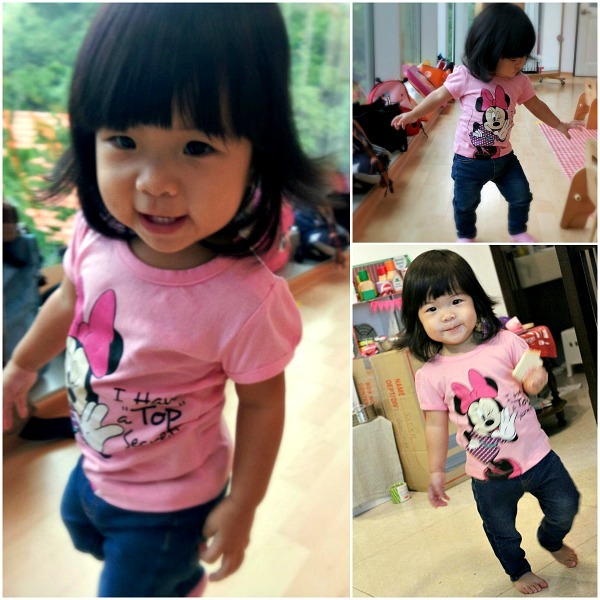 Here are a few photos of Bun rocking her Minnie Mouse t-shirt and her leggings made to look like jeans. She loves telling people she meets about the "Mouse" by pointing to the Minnie on her t-shirt! I personally LOVE these leggings. I think little tots in jeans are just so cute a look, but real jeans in our humid weather can be really uncomfortably hot. These leggings are thin, stretchable, and super duper comfortable. I need them in MY size! I'm pretty sure most of you would have already heard about FOX Kids & Baby. If you haven't, or if it has been a while since you've stepped into a store, do pop by and you might be pleasantly surprised. 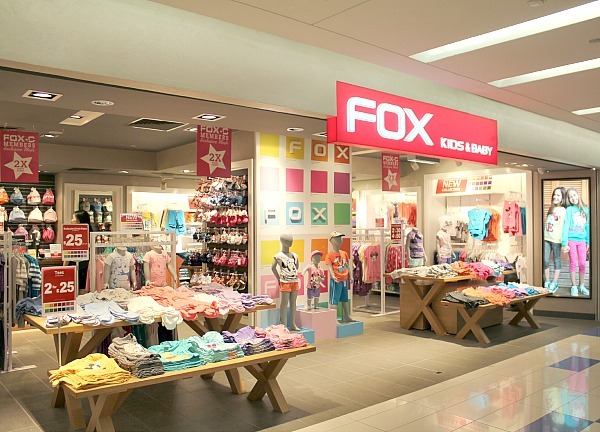 A list of FOX Kids & Baby stores in Singapore can be found here. Happy shopping, and join me in the next couple of months as I share various FOX promotions, and other highlights! i like that they are value for money! they are like a back-up for me if i forget to bring extra clothes for the kids! I think A is going to love that hello kitty top!! I can totally imagine Hello Kitty lovers flocking to FOX! They do have a very pretty range of Hello Kitty designs. You are right! I really liked how there were different styles for different moods and occasions. Having Bubs tag along opened my eyes to pieces I might have missed if shopping alone! She is so cute and I love her new outfits. I just got new Kids Clothing for my girls at Burlington. They are ready for the new school year now and we got great deals. I can't wait to get pictures of them in their new outfits. Bun looks really cute in the Minnie Mouse and leggings outfit. There was once when my son ate some cherries and the juice spilled and stained his white T-shirt! And this mama didn't bring any spare clothes! So we went to Fox and grabbed some clothes for him and thankfully, it was all affordable, phew! What I like about their clothes is that they're soft and even when the kids grew out of the stipulated age range, the clothes still can fit, so in a way, we're really getting extra mileage out if it!